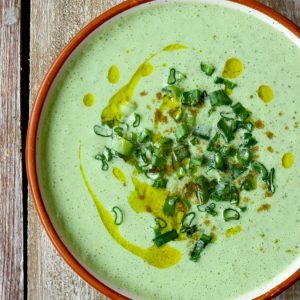 Spring Onion Raita? Ohh yes, you can do that. Prepared with the greenest spring onion stalks just perfect for the summer season. It is one of the coolest raita recipes on my blog. Why? Because of its refreshing color combination and the quick preparation time. This Spring Onion Raita gets ready in less than 20 minutes. Who doesn’t like to save such real fast recipes? All vegetarian, healthy and 100% gluten-free this Spring Onion Raita is one of my current favorite raita recipes. I never ever thought that apart from salads and garnishing those flavorsome spring onion stalks can be used to make raita as well. From past few days, it has become part of my every meal. And I am so happy about this new flavor discovery. It has me licking out every last corner of my blender and the bowl. Why I love it so much? The flavor is unique, delightful, extremely tasty and so stupidly easy to prepare. 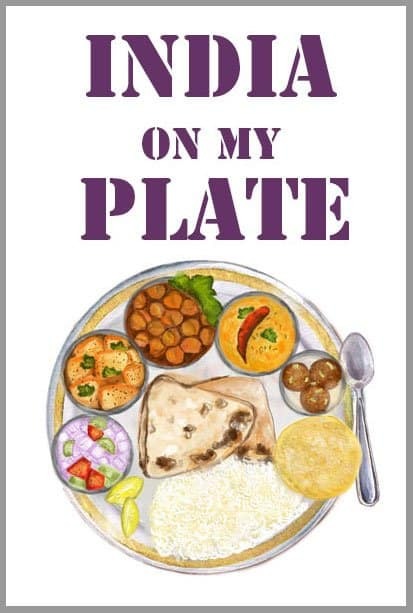 What else you need a good raita recipe! I am always searching for simple raita recipes with a distinct flavor profile. That is the reason Mint and Pomegranate Raita is also one of my favorite raita recipes. You might be thinking I am describing each one of them as my favorite but that is the truth. I love raita recipes which have the subtle aroma, the breath of freshness and a sharp taste. These two raita recipes definitely quality all these criteria. 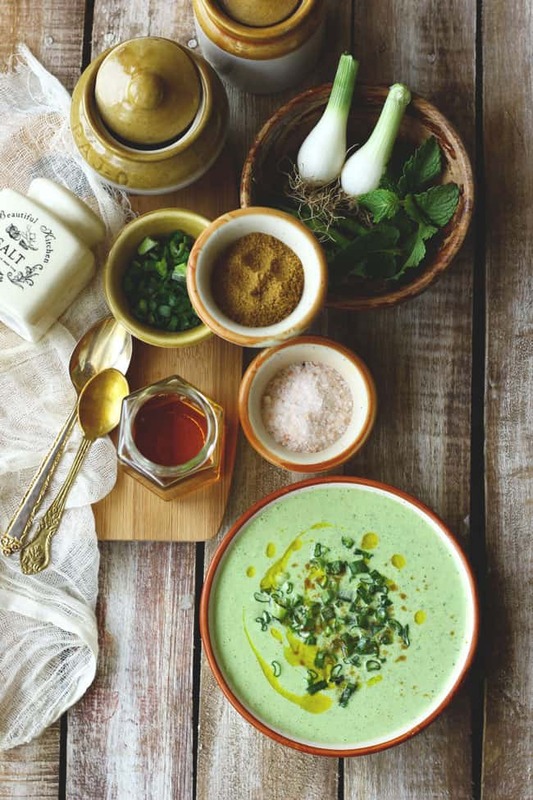 I have one more green raita recipe on the blog – Bathua Raita but that is purely for the winter season. When the fresh bathua leaves are available in the market. 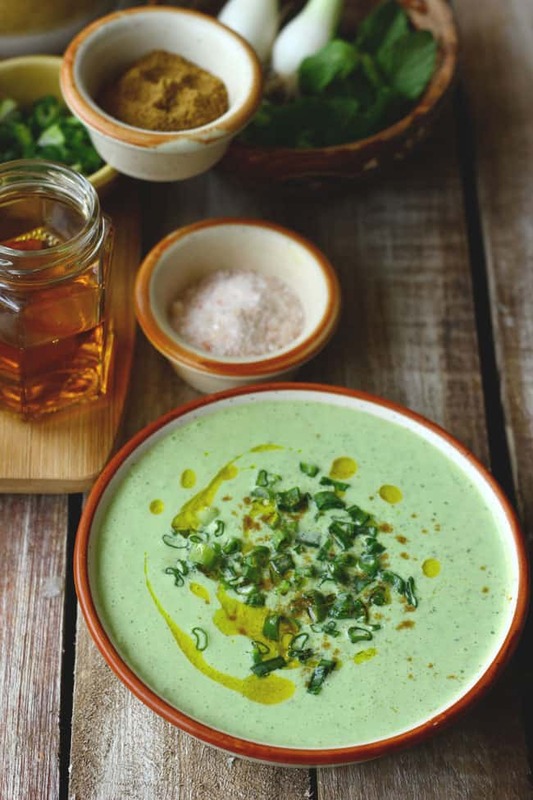 This Spring Onion Raita can be prepared throughout the year. So next time when you see a bunch of good spring onion stalks you know what to do with them – make raita. 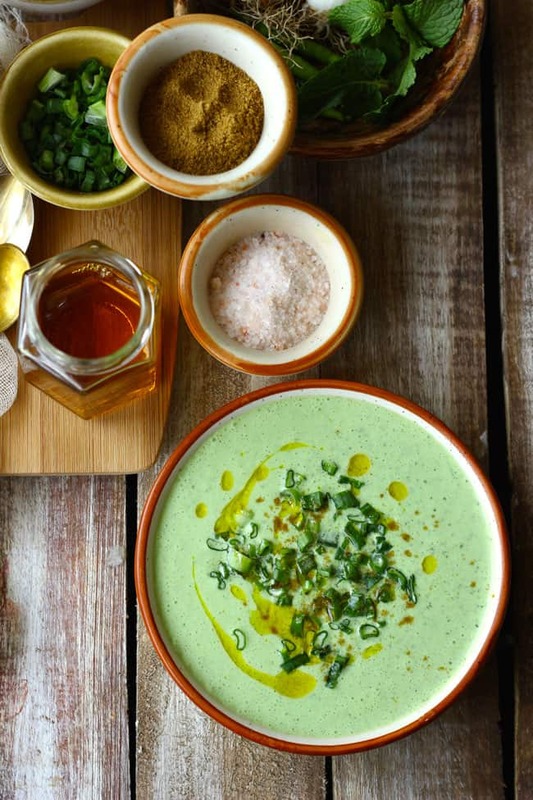 This green sauce or aka spring onion raita is an extremely versatile condiment. You can use it as a salad dressing, a dipping sauce or a marinade, either way, it only adds deliciousness to your table. The other day I made Garlic and Herb Roasted Potato for husband’s lunchbox and drizzled a tablespoon of this green sauce over it. It was a flavor bomb. And don’t even ask how superbly this spring onion raita compliments the Indian tandoori dishes. So now I have shared this Spring Onion Raita Recipe with you feel free to use it creatively to make your everyday meals tastier. Roughly chop the five spring onion green stalks. Remove the spring onion bulb. 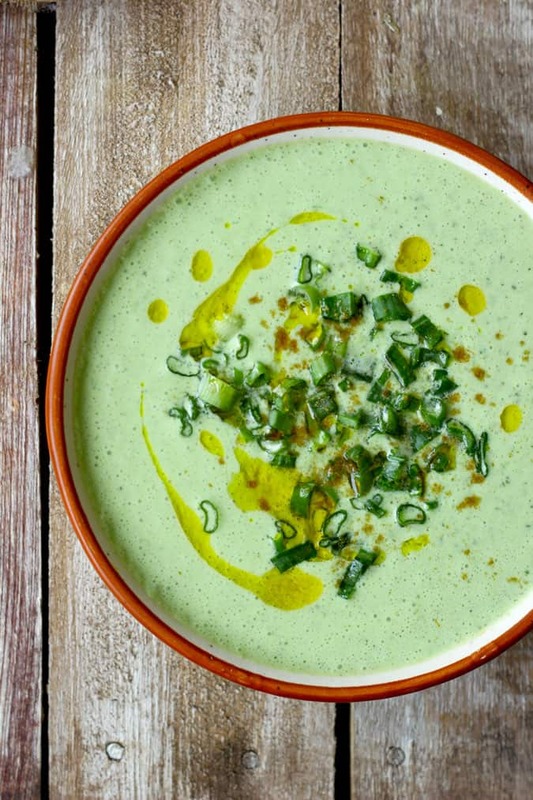 In a blender combine the yogurt, greens stalks, green chili, garlic and mint. Blend together all these ingredients to get a smooth liquid. Pour raita in a bowl. Add salt, pepper and mustard oil. Whisk nicely. Fine chop the remaining one stalk of green onion and mix it in raita. Keep the raita in the fridge until ready to serve.